As the name implies , this is a fine mesh, 8 mil netting. When stretched open the "lay flat" dimension is 9". It is used primarily for deer browse protection and photo degrades in approximately 12 months. 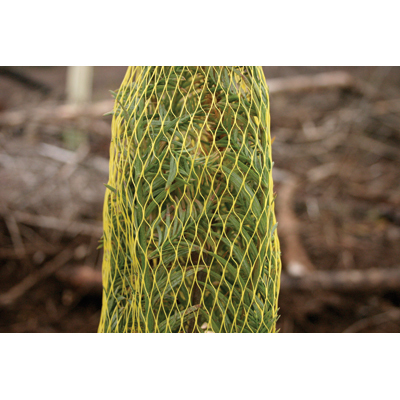 We recommend securing light net with a bamboo stake as it can come off in windy conditions. Simply insert the stake down the inside of the net and push into the ground. Leave 6" out of top. Remember to always "cuff" the netting at the top. Light net is light green in color. Use for all conifer species except cedar or redwood. This 15 mil netting is twice the strand gauge of light net. When applied to the seedling heavy net is therefore more rigid and when cuffed at the top it tends to hold the opening for the terminal leader to escape. The lay flat dimension when stretched out is 12" and the photo degradable life is approximately 12-18 months. Heavy net has been used successfully for deer & elk browse and rabbit damage. 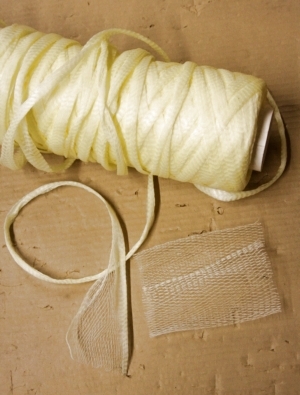 Heavy net is translucent yellow in color. Use for all conifer species except cedar, redwood or pine. Named after the U.S.F.S. 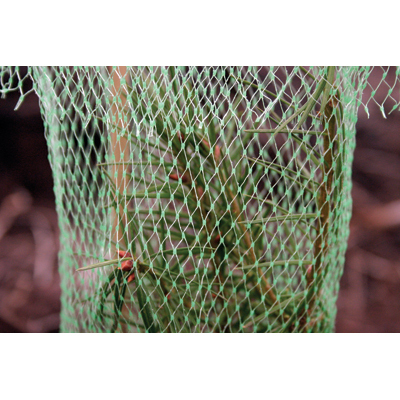 ranger station that first used it, Tiller net is the ideal netting for protecting cedar, redwood and pine seedlings. The mesh openings are larger and it is non-oriented so it stretches easily. This allows for less restricted lateral development and terminal leader escape although cuffing is still recommended. Approximately 12-18 month break down rate. Tiller net is deep yellow in color. Use for cedar, redwood, fir or pine. 17 mil rodent net is the heaviest net we have. It was originally called "Bud Cap Net" but should not be confused with our "Breathe Easy" bud caps. 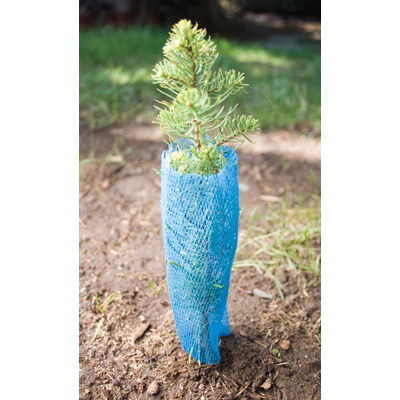 Rodent net is not intended to cover the entire seedling as it can be restricting. It is best used to protect the stem from ground level and up 5" or 6". Works very well for mice, voles and ground squirrel damage. We recommend either burying the net at the base or consider using landscape staples to hold the netting down so rodents cannot get underneath. Rodent net is blue in color.